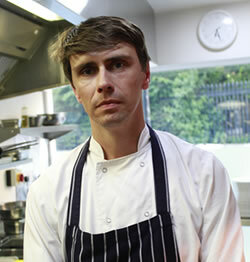 Chris Beverley has adopted Italian food as his favoured cuisine. His modern Italian menus will feature typical dishes such as Farro arancini; Fritto misto of squid, prawns and zucchini; Pasta e ceci; Pappardelle with rabbit and Prosecco ragù; Poussin, braised greens and lemon; Cod, artichoke, potato and taggiasche olives; Pannacotta with caramel oranges; and Chocolate and almond cake with crema di mascarpone. main courses at £14), Secondi from £15-£19, and Dolci from £6-£6.50. Italian list, and will be on hand to assist customers with wine selections. Wine prices will range from £17.50 (bottle), with 15 by the glass (from £4.50). There will also be a wide range of Italian aperitivi, cocktails and grappas. The 70-seat site is being refurbished and will feature a simple, understated design placing emphasis on the quality of the materials – there will be warm hand-blown glass lighting, encaustic tiling, and solid oak table tops set against whitewashed brick and stripped timber floors. Bibo will be open daily for lunch from Noon-2.30pm (until 3pm on weekends), and dinner from 6pm-10pm (until 11pm on Friday and Saturday, and until 9.30pm on Sunday). The 40-seat bar will be open throughout the day, offering a great selection of antipasti at lunch and dinner, as well as salumi and cheese throughout the afternoon. The General Manager of Bibo will be Amy Boden, previously at Pollen Street Social and The Square.